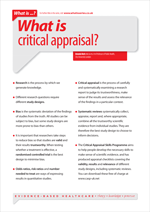 What is critical appraisal? | Whatis Series...? Research is the process by which we generate knowledge. Different research questions require different study designs. Bias is the systematic deviation of the findings of studies from the truth. All studies can be subject to bias, but some study designs are more prone to bias than others. It is important that researchers take steps to reduce bias so that studies are valid and their results trustworthy. When testing whether a treatment is effective, a randomised controlled trial is the best design to minimise bias. Odds ratios, risk ratios and number needed to treat are ways of expressing results in quantitative studies. Critical appraisal is the process of carefully and systematically examining a research report to judge its trustworthiness, make sense of the results and assess the relevance of the findings in a particular context. Systematic reviews systematically collect, appraise, report and, where appropriate, combine all the trustworthy scientific evidence from individual studies. They are therefore the best study design to choose to inform decisions.